Universal bookcase with practical magnetic closure. Silicone internal case and screen protector integrated into one protection. UNIVERSAL 5.8" - 6.2" UNIVERSAL 3.3" - 3.8" UNIVERSAL 3.8" - 4.3" UNIVERSAL 4.3" - 4.8" UNIVERSAL 4.8" - 5.3" UNIVERSAL 5.3" - 5.8"
Universal bookcase with practical magnetic closure. 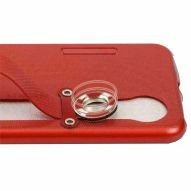 The silicone inner case ensures complete protection for your smartphone. Internal case and screen protector integrated into a single protection. Features: folding opening with magnetic clip; silicone inner case; camera, flash and headset hole; case and screen protector in one solution.